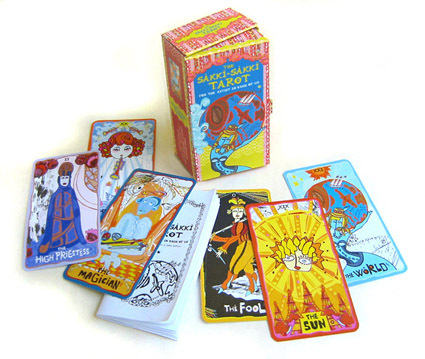 The Sakki-Sakki Tarot by artist Monicka Clio Sakki, is vibrant, quirky and positive, and brings a wonderful, riotous explosion of colors, patterns, exclamations, smiles and exaggerated gestures. It incorporates the structure and meanings of the Rider-Waite-Smith deck, together with Astrology, Kabbalah and personal symbolism. LIMITED EDITION. Includes 48p. instruction booklet. A unique addition to this deck, is an extra card “The Artist”, which establishes the Sakki-Sakki Tarot as a Tarot for the Artist in each of us, and for our individual and collective creative journeys.